But, wait a minute, I was a fast runner and could lay a bunt down with the best of them. Unfortunately, I didn’t see much opportunity to show these skills off. All they did was throw curve balls at me and all I did was swing and miss. I guess in some sort of act of retribution, my family received a Wii for Christmas. A baseball game came with the sports package and I loved that because it let me play the pitcher and throw curve balls at everyone I faced, including my daughter. With every pitch and strike I laughed in a way that scorned the ghosts of my little league past. Finally, payback! But, as I sit here thinking about these memories and experiences, I realize how much of my life, quite frankly… have been curve balls. And, while I look back at little league and realize my batting average was awful, perhaps I shouldn’t check myself out so quickly? Maybe I, or we… are better batters than we give ourselves credit it for? In this, isn’t life a lot about confidence from familiarity? When I played little league, I already struck out in my mind before I even stepped up to the plate. Sometimes I wonder if we view some of our days like this too? Have we struck out before we even made it to the shower? What do the curve balls of life look like? Cancer, unemployment, surgeries, relationships, and the list goes on. For some around the globe, the curveball is all they know and therefore, they simply adapt and respond accordingly. All things being equal, they have learned to make the curveball their friend and therefore swing away. In what would appear to us to be the most awful of living conditions, these people of the world find some way to smile. Perhaps their physical bodies have yet to conquer the curveball, but their souls sure have. I too, want to make the curveball my friend. Imagine life if all we got was the easy pitches. Would we be the same person we are today if this was the case? The fact is, we all need to face curveballs. It’s part of life, it’s part of our growth, it’s part of our experience. Yes, I hate this reality too. But, life always prepares us for what’s next. We may not realize that at the time we are facing it, but in time… these lessons always seem to come to the surface after much thought and reflection. Did somewhere along the way teach us that the curveball was not our friend? That at the very site of the curveball that we were to fold up shop and give up? That the curveball was invincible and there was no way we would ever hit it? As a little leaguer, the more I faced the curveball… the more I feared the curveball. The only confidence I gained from familiarity here was the fact that I would swing and miss. 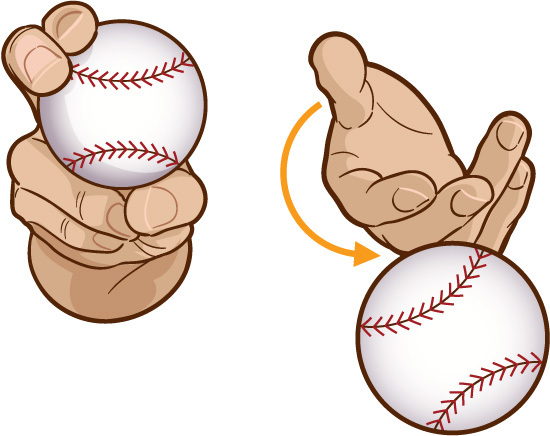 Matter of fact, I am quite positive the first pitch I always faced was the curveball. They knew that is all they needed to do. After that, they could throw anything at me and I was mentally checked out. Funny, I probably never actually struck out on a curveball because of this. Again, isn’t that life? We get one curveball and we check out. Even though the next two pitches are slow and outside, we still swing and miss. I guess the first thing we need to remember is to never give up when facing the curveball because chances are the next two or three pitches will not be curveballs and potentially could be the very pitches we need to get on base or even knock the ball out of the park. 10% of life is what happens to you. 90% is how you respond. I read this once on a poster hanging in a hallway at a Nordstrom store. Isn’t that the truth? At some point in life, we will look back at what seemed a season with constant curveballs. But, in all actuality, only 10% of the pitches were curveballs. How do we get good at facing the curveball? Someone is trying to strike me out or someone was trying to make me better because they knew I could handle it. I also had to realize that this was no longer little league. This was the major leagues and for about 12 months felt like all I got was constant curveballs that each seemed to be fastballs as well. Those 12 months were brutal and I know many probably wondered how long I would last. Quite frankly, I wondered how long I would last. But something transpired over those 12 months. For starters, I lasted. I also began to study the curveball through the lens of my team and coaches. I began to anticipate the curveball and embrace its reality. This changed everything. Suddenly, my posture at the plate was much different. It was more confident. I suppose the lesson here is the importance of who you surround yourself with. There is perspective to be gained all around us and we never stop and ask for it. For me, it was building a team of people gifted in areas I am not. It was surrounding myself with mentors and those who have gone before me in life’s experiences. Surrounding myself with such people gained me much needed confidence which allowed me to face various situations that led to gaining experience. Not only did I learn more about the curveball, I learned more about myself. Why was I afraid of the curveball in the first place? Was I afraid I was going to get hit? As much as I hate to admit it, this is probably more at the core than I want to believe. I don’t want to get hit because I don’t want to hurt. But, what is life without pain, but yet the life that still awaits us? A relationship goes bad, we lose a job, we fail, we get hurt. Who wants this for their life? I sure don’t. But, take a moment to ask this of those who have gone before us in years and they will say without it… they would not be who they were. In life, these are the people we should listen to. Wisdom is a valuable thing. Often times, it is all around us, but we fail to see it. Instead, we seek everything else. The coaches always told me the curveball was a weakness, but all they ever threw at me in practice… was the fastball. How would this help? If only I asked for the curveball? What is classic here is that they always told me this, but I don’t think they showed me this in practice because they had no idea how to even throw a decent curveball that didn’t look just like junk. In America, we have made it a zillion dollar business to help people face and conquer the curveball. Sadly, many claim to be experts… many are not. Be careful out there. Don’t be timid, be careful with evaluating such people. As I think about this and all of my life experiences up to this point, maybe it’s time that I seek to be-friend the curveball? Maybe this is the rite of passage we all need to face? Perhaps in this we may learn to truly start living. Let’s face it, nobody likes striking out before they even face the first pitch. Embrace the fact that the curveball will come. Fair or not fair, it WILL come. Will you stay in the box, lean in, and face it? Or, will you check out? You can do it. I know you can. I invite you to like my new Facebook page for my upcoming new book called Strategistics here. Which is understandable because what hurts more than the pain of change/etc is the failure of daily due-diligence (spoudazo). Failing in the fastball’s of life (i.e. marriage, parenting, friendship, purity, etc.) can tend to leave scars much deeper than the curveballs of life (i.e. laid off, health predicaments, national/societal disaster, etc.). Perhaps this is attributed to the fact that with the curve, we often ‘don’t see it coming’, as it isn’t thrown as often. As a result, it’s severity is lessened. We know we can get back up again because we’re now counting on the heater fat and out over the plate…the one we can gap for a stand-up double. As a pitcher who relied heavily on the curveball, I know it’s ‘power’ came from keeping the hitter off-balance–to throw it when he least expected it. But I also know, as you allude to, that with practice the ‘hanging’ curve can become a hitters best friend.